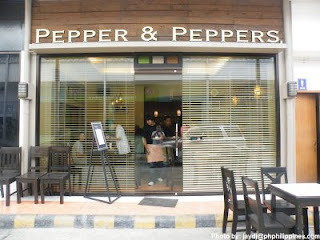 On day 2 of Davao Food Appreciation Tour, our first food stop was Pepper and Peppers. The beautiful owner was our host and made sure we were all served and full. The place was cozy, though small. It compensated for the small dining area by adding tables outside to cater to additional diners. When you go inside, seats and tables are located left and right. The center is the aisle leading to the counter where a bar of different alcoholic beverages are displayed at. Some of the dishes we were served with were baby back spare ribs, iberian chicken, crispy sisig and breaded fish. All their dishes were nicely decorated when served. The Iberian chicken was served in a huge transparent pyrex bowl, the baby back ribs and breaded fish in a square flat plate and crispy sisig in its standard sizzling black grill platter. I was guessing that their foods would be spicy and hot based on the restaurant's name, but surprisingly, it isn't, which is perfectly fine with me. Everything was tasty and delectable. I especially liked the baby back ribs for it's tender texture and meaty contents. All of the dishes served seemed to be good to serve 2 to 3 people each. Based on their other dishes in the menu, I'd love to sample more of their foods especially the peppered steak, so I could fully experience the name's specialty. 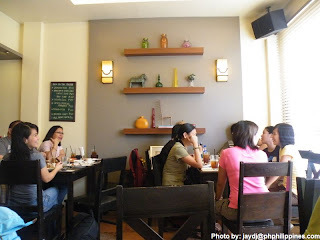 Pepper & Peppers is located at “The Site” , Jacinto Ext (near Bangko Sentral). Book your group in advance especially if you plan on ordering their Iberian chicken since they oven bake it for two hours. You can reach them at (082) 303-5955.